I know it's been awhile, but I finally found someone today while waiting for the bus. We even had lunch together. I know it's not really a surprise, but the whole time we talked it was about books. 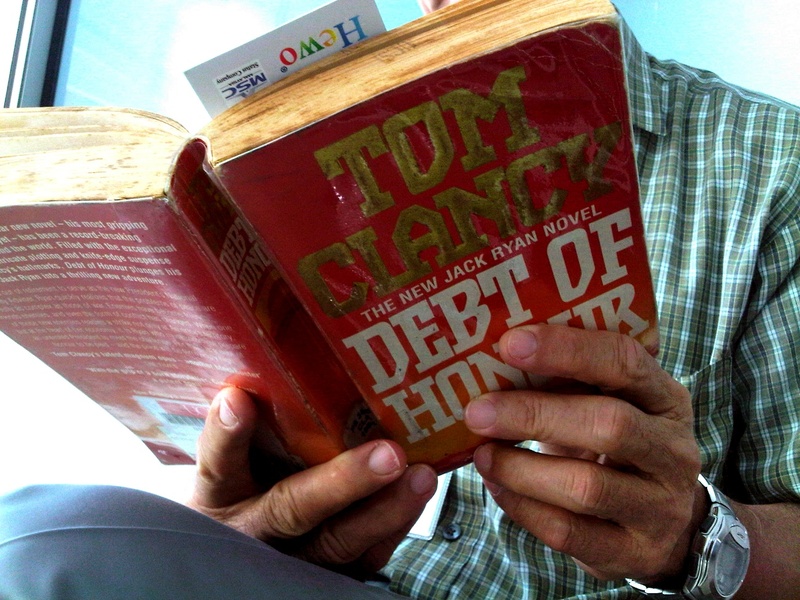 He's moved on to reading Clancy because he's almost done with all of Robert Ludnum and Michael Crichton's work. (I think Ludnum's been read here before, but in case Crichton doesn't ring a bell, his most famous work is arguably Jurassic Park). 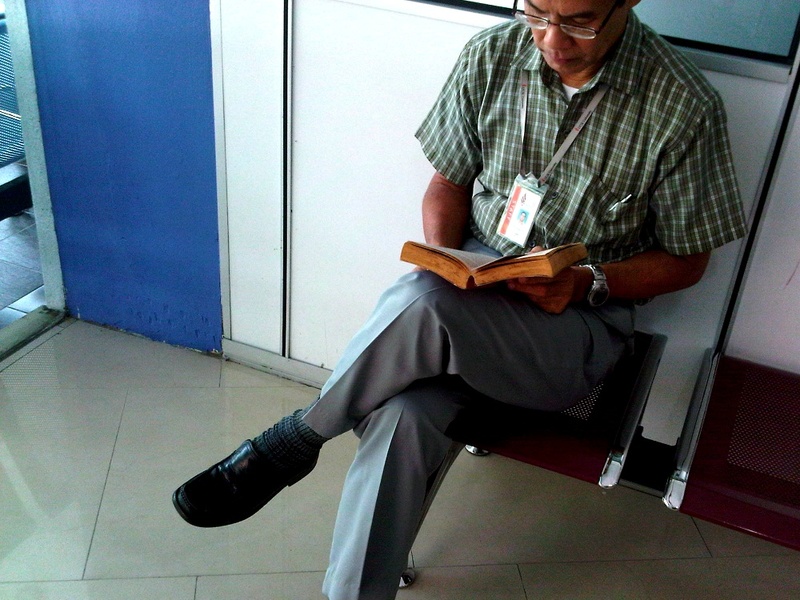 He's been reading since primary school, and now reads about six books a year. I ask him where he got the book from (a nearby library) and whether he goes to libraries often (he's a member of the National Library, but hasn't been there in years). In turn, he asks me whether I've heard of a TV show called "Reading Room" (I hadn't, but here's its IMDB page). In his words: "It's about an old retired man who rented a shop to encourage young people to read." When do you read? I ask. "To wait for something, anything lah. Like now. I even read over meals. If I find a book interesting, I can keep reading into wee hours of the night." And for the first time since I've started this site, the tables turn. The laboratory manager is asking me questions. "What do you like to read?" It's a question I ask everyone I come across for ReadKL, but one I've never thought of an answer for. A few seconds of silence (where do I start?) "These days, books about the brain," I begin, "but I grew up reading Greek mythology, and other books lying around the house. Fairy tales, Middle Eastern tales, the Mahabharata, Tao Te Ching. After that it was classic fiction, then contemporary fiction, like wild imaginative stuff, and now more science and non-fic I guess. I was lucky that way, to start out young. I never stopped." "I liked Enid Blyton when I was young. And Agatha Christie. My eldest son developed a reading habit when he was small too," he tells me, quite pleased, "but the others not so much." I ask him how old his son is. "Thirty-one". I don't know why I am surprised, but I am; he then tells me he's sixty-two himself. I like that his smile when he mentioned his son was still so new, like we weren't talking about decades ago. We also talk about how since books didn't exist naturally in our environment, the human brain probably wasn't wired to read; we had to train it that way. Maybe if enough time passed without practice we'd never find the desire to pick up books, having replaced it with other 'unnatural' habits that were easier to acquire, like electronics. We also realize we can't remember which Bronte sister wrote Jane Eyre. (It was Charlotte). By the time we walk up from lunch, the bus arrives. Perfect timing. We sit in different parts of the bus, and I noticed he had returned to his book. PS: Have fixed the comments section. All spam is gone and hopefully for good. If you're reading this, thank you for still reading this. It's been one dry spell after another for ReadKL, but when a break comes along, I'd like to think it was worth it.